This "Filbert Cake" wasn't really difficult to bake, but I had to endure problem after problem. Nothing went smoothly or as I expected. Every time I thought that I had overcome a difficulty, another one lurked around the corner like a sadistical vulture waiting for it's prey! Making this cake was not only a laborious time- as well as energy-consuming task, but it was at the same time a very stressful and tedious one. And the worst in all that is that it took me hours and days to get it together and, at the end, the result wasn't satisfying at all! I could have cried out of sheer frustration!!! The recipe wasn't all that clear, especially when it came to the whipped cream and the apricot glaze parts. The buttercream was too soft and not easy to pipe, the chocolate glaze was far too runny and refused to set after half an hour's cooling, thus being a bad base for the decoration which didn't stay in place and slid down the sides of the cake. I must confess that I really had a bad time making that "Filbert Cake", although I was miraculously calm. I went through periods of extreme tension in order to save my cake from becoming a total disaster. I had to repair it over and over, and operate certain cake-rescuing interventions which made me feel a little like Dr.Troy & Dr. McNamara of Nip/Tuck!!! A real pain in the neck! Taste-wise, it was undoubtedly delicious and refined, even if it wasn't exactly the kind of baked good that I'd make or eat at that time of the year (summertime/it is more like a winter cake). Anyway, we (2 eaters only) had much pleasure eating that rich cake. As a matter of fact, it was gobbled greedily and disappeared after a few servings only! The "Génoise" had that perfect nutty fragrance which I love and was fluffy/light, the "Praline Buttercream" was scrumptious, although it's texture wasn't satisfying enough (too runny), and the "Chocolate Ganache" was fine, eventhough it wasn't my favorite glaze. Because of all that, I might not bake this cake again as it was far too finicky to make. I will keep the "Génoise" recipe, because it was wonderful, perfect and different from all the others I know (original and intriguing method). Maybe this "Filbert Cake" recipe wasn't on the level of my expectations, but it was nonetheless a very good way to experience with certain baking techniques. This challenge made me learn a lot, helped me master/control my nerves and taught me to never throw in the towel. So, I dearly want to thanks Chris at "Mele Cotte" (USA) for having chosen that daring recipe!!! From "Great Cakes" by Carol Walter. 1. Position rack in the lower 3rd of the oven and preheat to 350°F/180° C.
2. Grease and flour a 25 x 5 cm/10” X 2” inch round cake pan. 3. Using a food processor, process nuts, cake flour, and cornstarch for about 30 seconds. Then, pulse the mixture about 10 times to get a fine, powdery mixture (You’ll know the nuts are ready when they begin to gather together around the sides of the bowl/while you want to make sure there aren’t any large pieces, don’t over-process). Set aside. 4. Put the yolks in the bowl of an electric mixer, with the whisk attachment, and beat until thick and light in color, about 3-4 minutes on med-high speed. Slowly, add 3/4 cup of sugar (It is best to do so by adding a tablespoon at a time, taking about 3 minutes for this step/when finished, the mixture should be ribbony). 5. Blend in the vanilla and grated lemon rind. Remove and set aside. 6. Place egg whites in a large, clean bowl of the electric mixer with the whisk attachment and beat on medium speed, until soft peaks. Increase to med-high speed and slowly add the remaining 1/4 cup of sugar, over 15-20 seconds or so. Continue to beat for another 1/2 minute. 7. Add the yolk mixture to the whites and whisk for 1 minute. 8. Pour the warm butter in a liquid measure cup (or a spouted container). 9. Put the nut meal in a mesh strainer (or use your hand – working quickly) and sprinkle it in about 2 tablespoons at a time – folding it carefully for about 40 folds (Be sure to exclude any large chunks/pieces of nuts/again, work quickly and carefully as to not deflate the mixture). 10. When all but about 2 Tbsp. of nut meal remain, quickly and steadily pour the warm butter over the batter. Then, with the remaining nut meal, fold the batter to incorporate, about 13 or so folds. 11. With a rubber spatula, transfer the batter into the prepared pan, smoothing the surface with the spatula or back of a spoon (If collected butter remains at the bottom of the bowl, do not add it to the batter! It will impede the cake rising while baking). 12. Tap the pan on the counter to remove air bubbles and bake in the preheated oven for 30-35 minutes (You’ll know the cake is done when it is springy to the touch and it separates itself from the side of the pan). 13. Remove from oven and allow to stand for 5 minutes. Invert onto a cake rack sprayed with nonstick coating, removing the pan. Cool the cake completely. If not using the cake right away, wrap thoroughly in plastic wrap, then in a plastic bag, then in the refrigerator for up to 3 days. If freezing, wrap in foil, then the bag and use within 2-3 months. 1. In a small, yet heavy saucepan, bring the water and sugar to a boil and simmer for 5 minutes. 2. Remove from heat, add the liqueur. 3. Cool slightly before using on the cake. It can be made in advance. 1. Blend 1/2 cup buttercream into the paste, then add to the remaining buttercream. 2. Whip briefly on med-low speed to combine. 1. Place the egg whites in a lg/ bowl of a elevtric mixer and beat with the whisk attachment until the whites are foamy and they begin to thicken (just before the soft peak stage). 2. Set the bowl over a saucepan filled with about 2 inches of simmering water, making sure the bowl is not touching the water. Then, whisk in the sugar by adding 1-2 tablespoon of sugar at a time over a minutes time. 3. Continue beating 2-3 minutes or until the whites are warm (about 48° C/120° F) and the sugar is dissolved (the mixture should look thick and like whipped marshmallows). 4. Remove from pan and with either the paddle or whisk attachment, beat the egg whites and sugar on med-high until its a thick, cool meringue – about 5-7 minutes (do not overbeat). 5. Set aside. 6. Place the butter in a separate clean mixing bowl and, using the paddle attachment, cream the butter at medium speed for 40-60 seconds, or until smooth and creamy (do not overbeat or the butter will become toooooo soft). 7. On med-low speed, blend the meringue into the butter, about 1-2 Tbs at a time, over 1 minute. 8. Add the liqueur and vanilla and mix for 30-45 seconds longer, until thick and creamy. 9. Refrigerate 10-15 minutes before using. My buttercream won’t come together: Reheat the buttercream briefly over simmering water for about 5 seconds, stirring with a wooden spoon. Be careful and do not overbeat. The mixture will look broken with some liquid at the bottom of the bowl. Return the bowl to the mixer and whip on medium speed just until the cream comes back together. My buttercream is too soft: Chill the buttercream in the refrigerator for about 10 minutes and rewhip. If that doesn’t work, cream an additional 2-4 Tbs of butter in a small bowl– making sure the butter is not as soft as the original amount, so make sure is cool and smooth. On low speed, quickly add the creamed butter to the buttercream, 1 Tbs at a time. Refrigerate in an airtight container for up to 5 days, or can be frozen for up to 6 months. If freezing, store in 2 16-oz. plastic containers and thaw in the refrigerator overnight or at room temperature for several hours. 1. Line a jelly roll pan with parchment and lightly butter. 2. Put the sugar in a heavy 10-inch/20.5cm skillet/pan. 3. Heat on low flame for about 10-20 min until the sugar melts around the edges (do not stir the sugar). 4. Swirl the pan if necessary to prevent the melted sugar from burning. 5. Brush the sides of the pan with water to remove sugar crystals (if the sugar in the center does not melt, stir briefly). 6. When the sugar is completely melted and caramel in color, remove from heat. Stir in the nuts with a wooden spoon and separate the clusters. 7. Return to low heat and stir to coat the nuts on all sides. 8. Cook until the mixture starts to bubble (remember – extremely hot mixture). 9. Then onto the parchment lined sheet and spread as evenly as possible (as it cools, it will harden into brittle). 10. Break the candied nuts into pieces and place them in the food processor. 11. Pulse into a medium-fine crunch or process until the brittle turns into a powder. 12. To make paste, process for several minutes. 13. Store in an airtight container and store in a cook dry place (do not refrigerate). 1. In a small, yet heavy saucepan, bring the water and preserves to a slow boil and simmer for 2-3 minutes. 2. Remove from heat and, using a strainer, press the mixture through the mesh and discard any remnants. 3. With a pastry brush, apply the glaze onto the cake. If the glaze is too thick, thin to a preferred consistency with drops of water and if the mixture begins to stick to the bottom of the saucepan, add water as needed. 1. Blend vanilla and liqueur/rum together and set aside. 2. Break the chocolate into 1-inch/2.5cm pieces and place in the basket of a food processor and pulse until finely chopped. 3. Transfer into a medium sized bowl and set aside. 4. Heat the cream and corn syrup in a saucepan, on low, until it reached a gentle boil. 5. Immediately and carefully pour over the chocolate. 6. Leave it alone for one minute, then slowly stir and mix the chocolate and cream together until the chocolate is melted and incorporated into the cream. 7. Carefully blend in vanilla mixture. If the surface seems oily, add 1/2 - 1 tsp hot water. The glaze will thicken, but should still be pourable. While warm – great fudge sauce. While cool or lukewarm – semisweet glaze. Slightly chilled – can be whipped into a filling/frosting. Cold & solid – the base of candied chocolate truffles. 1. Cut a cardboard disk slightly smaller than the cake. 2. Divide the cake into 3 layers and place the first layer top-side down on the disk. 3. Using a pastry brush, moisten the layer with 3-4 Tbs of warm sugar syrup. 4. Measure out 1 cup of praline buttercream and set aside. 5. Spread the bottom layer with a 1/4-inch/6mm thickness of the remaining buttercream. 6. Cover with 1/2 of the whipped cream, leaving 1/4-inch/6mm border around the edge of the cake. 7. Place the middle layer over the first, brush with sugar syrup, spreading with buttercream. 8. Cover with the remaining whipped cream. 9. Moisten the cut side of the third layer with additional sugar syrup and place cut side down on the cake. 10. Gently, press the sides of the cake to align the layers. 11. Refrigerate to chill for at least 30 minutes. 12. Lift the cake by sliding your palm under the cardboard. 13. Holding a serrated or very sharp knife with an 8-inch/20cm blade held parallel to the sides of the cake, trim the sides so that they are perfectly straight. 14. Cut a slight bevel at the top to help the glaze drip over the edge. 15. Brush the top and sides of the cake with warm apricot glaze, sealing the cut areas completely. 16. Chill while you prepare the ganache. 17. Place a rack over a large shallow pan to catch the ganache drippings. 18. Remove the gateau from the refrigerator and put it the rack. 19. With a metal spatula in hand, and holding the saucepan about 10 inches/25cm above the cake, pour the ganache onto the cake’s center. 20. Move the spatula over the top of the ganache about 4 times to get a smooth and mirror-like appearance (the ganache should cover the top and run down the sides of the cake). 21. When the ganache has been poured and is coating the cake, lift one side of the rack and bang it once on the counter to help spread the ganache evenly and break any air bubbles (work fast before setting starts). 22. Patch any bare spots on the sides with a smaller spatula, but do not touch the top after the “bang”. 23. Let the cake stand at least 15 minutes to set after glazing. 24. To garnish the cake, fit a 12 – 14-inch/30.5 - 35.5cm pastry bag with a #114 large leaf tip. 25. Fill the bag with the reserved praline cream. 26. Stating 1/2 inch/1.3cm from the outer edge of the cake, position the pastry tube at a 90 degree angle with the top almost touching the top of the cake. 27. Apply pressure to the pastry bag, moving it slightly toward the center of the cake. As the buttercream flows on the cake, reverse the movement backward toward the edge of the cake and finish by pulling the bag again to the center. Stop applying pressure and press the bag downward, then quickly pull the tip up to break the flow of frosting. 28. Repeat, making 12 leaves evenly spaced around the surface of the cake. 29. Make a second row of leaves on the top of the first row, moving the pastry bag about 3/4 inch/1.9cm closer to the center (the leaves should overlap). 30. Make a 3rd row, moving closer and closer to the center. 31. Add a 4th row if you have the room. But, leave a 2-inch space in the center for a chopped filbert garnish. 32. Refrigerate uncovered for 3-4 hours to allow the cake to set. 33. Remove the cake from the refrigerator at least 3 hours before serving. Leftover cake can be covered with foil and kept in the refrigerator for up to 5 days. Unfortunately, until now, I have not been able to test any of her scrumptious recipes, but her creations have nonetheless inspired me as a homecook and homebaker. As, this week, foodbloggers all over the world will be making one of the recipes from her blog, and then posting the recipe on their own blog (see infos here & here), I can finally remediate to that situation. So, in rememberance of the sweet and witty Sher, I have decided to blog about her "Potatoes Bakes With Parmiginano" recipe (see her post) which has caught my attention. If I had had a little more time this weekend, I would surely have baked either her "High-Rise's Cornbread" or her "Spinach And Feta Cheese Yeast Bread". Anyway, I promise that I'll make those gorgeous loaves in the near future. 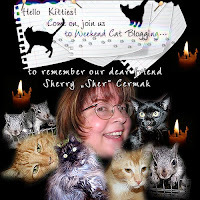 As there are so many other recipes that I'd love to test, I really hope that Sher's blog will stay open in order for us to remember her through the marvelous dishes that she shared with us and her awesome cat/squirrel posts. In that way, we'd still be able to feel the positive vibrations which she communicated to us via this much loved blog. Needless to say that this recipe was an absolute hit as this speciality's yum factor is high! Even my boyfriend who isn't very fond of potatoes ate this dish with much appetite and had a second serving! This Italian version/cousin of the French "Gratin Dauphinois" is incredibly scrumptious and flavorful. The potatoes melt in the mouth and pair fantastically with the cream, nutmeg and Parmesan in order to create one the most luscious gratins I have ever eaten. Highly satisfying. Comfort food at it's best! Recipe by Biba Caggiano "A Taste Of Italy". 1. Put the potatoes in a large pan and cover with water. Bring to a boil and cook until they are tender, but still show resistance. 2. Cool and peel, then slice into 6mm (1/4 inch) rounds. 3. Preheat the oven to 200°C (400° F). 4. Butter a dish and layer the potatoes into it, overlapping them. 5. Mix the nutmeg in the milk/cream and pour pour over the potatoes. 6. Season with salt and sprinkle the cheese on top. 7. Dot with the butter. 8. Cook in the oven in the middle rack, for about 20 minutes or until the cheese is melted and the dish has browned to your satisfaction. I used 1kg (2 pounds) potatoes instead of the quantity requested and kept the same quantity cream/milk/seasoning. Once you've placed the potatoes in the dish and covered them with the liquid (point 5), you can refrigerate the dish overnight and cook it the next day. You can even cook it and then reheat it the next day (it tastes even better that way!). Use as accompaniment to meat or sausages and serve with a seasonal salad. Recette de Biba Caggiano, tirée de son livre "A Taste Of Italy". 1. Mettre les pommes de terre dans une grande casserole et couvrir d'eau. Porter à ébulition et cuire jusqu'à ce que les pommes de terre soient tendres, mais toujours légèrement fermes. 2. Laisser refroidir et peler, puis couper en rondelles de 6mm d'épaisseur. 3. Préchauffer le four à 200°C (400° F). 4. Beurrer un plat à gratin et déposer les pommes de terre en les superposant. 5. Mélanger la noix de muscade au lait/à la crème et verser sur les pommes de terre. 6. Saler et saupoudrer avec le parmesan. 7. Déposer quelques noix de beurre. 8. Cuire au centre du four, pendant environ 20 minutes ou jusqu'à ce que le dessus du gratin soit doré à votre goût. 9. Servir chaud ou à température ambiante. J'ai seulement utilisé 1kg de pommes de terre pour la même quantité de liquide (crème/lait) et d'assaisonnement. Une fois que vous êtes arrivé au point 5, vous pouvez mettre le plat au frigo, jusqu'au lendemain et terminer la recette à ce moment-là. Vous pouvez aussi cuire le gratin à l'avance et le réchauffer le moment venu (c'est encore meilleur!). Servez ce plat avec de la viande ou des saucisses et accompagnez-le d'une bonne salade de saison. May you rest in peace and have a great time in Heaven, with your mom, Upsie & Pumpkin! All my thoughts go to her family and friends. Both Fridolin and Maruschka are already missing you, Sher! Last Sunday, I decided to go out for a little walk around the block, although the weather was very hot, heavy and a storm was building in the horizon. The sky over the Jura mountains was threateningly black. An extremely dramatic vision. All that rumbling backdrop of darkness created marvelous and striking contrasts with the surrounding green July landscapes. A wonderful moment which I tried to immortalize through photography (click on the pictures to enlarge). Enjoy! As I'm addicted to yeast, madly drawn to baking and incurably in love with bread, for my last birthday (which happens to fall right on Christmas day), I received Beth Hensperger's "The Bread Bible" which is a wonderful cookbook dedicated to this irreplaceable staple. Her book was a real discovery, as, until now, not one of her recipes was a flop as I have got only good results so far. All on the contrary! Until now, I have discovered no flaws or errors within the pages of this book. Beth Hensperger is passionate about bread and very professional. All her recipes give incredible results, are well-explained, innovative and delightful. Although her cookbook carries quite a misleading title that can/could confuse most of us, because this lengthy book is neither totally authoritative nor complete (that would be impossible), I believe that no baker, nor kitchen should be without that masterpiece! Whether you are new to baking or an experienced baker, this excellent cookbook will provide you with a collection of compelling bread recipes which will make your eyes roll back in your head while eating her scrumptious creations! And this "Honey And Seed Bread" is just the perfect example to illustrated what I was saying in the preceeding lines... That bread has a lot of crunch thanks to the seeds, it's soft interior as well as smooth exterior are delightful and it's slight sweetness is irresistible. It is a loaf that is terrifically scrumptious and awesomely satisfying on all levels! Recipe by Beth Hensperger, taken from her book "The Bread Bible" and slightly adapted by Rosa @ Rosa's Yummy Yums. Makes two 23 x 13cm (9-by-5-inch) loaves. 1. Pour the warm water in a small bowl. Sprinkle the yeast and sugar over the surface of the water. 2. Stir to disolve and let stand at room temperature until foamy, about 10 mintues. 3. In a large bowl, combine the milk, butter, honey and yeast mixture. 4. Add 2 cups flour, salt, sunflower seeds, poppy seeds and sesame seeds. Beat hard until smooth, about 3 minutes. 5. Add the remaining flour, 1/2 cup at a time, until a shaggy dough is formed. 6. Turn the dough out onto a lightly floured work surface and knead until smooth and silky, 4 to 5 minutes. 7. Place the dough in a greased deep bowl. Turn once to grease the top and cover with a plastic wrap and then a tea towel. 8. Let the dough rise at room temperature until doubled in bulk, 1 to 1 1/2 hours. 9. Gently deflate the dough and turn it out onto a lightly floured work surface.10. Grease two 9-by-5-inch (23 x 13cm) loaf pans. 11. Divide the dough into 2 equal portions. Form each portion into a loaf and place it seam side down into the loaf pan. 12. Cover with a tea towel and let rise 1 inch above the rims of the pans, about 45 minutes. 13. Twenty minutes before baking, preheat the oven to 190° C (375° F). 14. Brush with egg glaze, for a dark and glossy crust. 15. Put the loaf pans on the center rack of the oven and bake 40 to 45 minutes, or until golden brown, and the loaves sound hollow when tapped with your finger. 16. Transfer the loaves immediately to a cooling rack. While kneading the bread, don't forget to dust your working surface with flour (only 1 Tbs at a time) if the dough tends to by sticky. Once you have brushed the loaves with the egg glaze, you can sprinkle them with the seeds of your choice (poppy seeds, sesame seeds, sunflower seeds, pumpkin seeds, etc...). This bread is delicious with almost anything. It is ideal for making Cheese On Toast, Crostini, Bruschetta or Croutons. Recette de Beth Hensperger, tirée du livre "The Bread Bible" et adaptée par Rosa @ Rosa's Yummy Yums. Pour deux pains de 23 x 13cm. 1. Mettre l'eau tiède dans un petit bol. Saupoudrer avec la levure et le sucre. 2. Mélanger pour dissoudre et laisser reposer, à température ambiante, jusqu'à ce que le mélange devienne mousseux, pendant environ 10 minute. 3. Dans un grand bol, mélanger ensemble le lait, le beurre, le miel et le mélange levure/sucre/eau. 4. Ajouter 2 tasses de farine, le sel, les graines et bien battre pendant 3 minutes, jusqu'à ce que ce mélange devienne lisse. 5. Ajouter le restant de farine, 1/2 tasse à la fois et bien l'incorporer afin d'obtenir une boule de pâte. 6. Sur un plan de travail fariné, pétrir pendant 4 à 5 minutes, jusqu'à ce que la pâte soit souple et élastique. 7. Mettre la pâte dans un grand bol légèrement huilé/beurré et faites tourner la pâte dans le bol afin de bien l'enduire d'huile/de beurre. Couvrir avec du film alimentaire, puis avec un linge.8. Laisser lever, à température ambiante, jusqu'à ce que la pâte ait doublé de volume, pendant 1 à 1 1/2 heures.9. Dégonfler la pâte et la mettre sur une surface farinée.10. Graisser/beurrer deux moules de 23 X 13cm et diviser la pâte en deux parts égales. 11. Donner la forme d'un pain rectangulaire, puis mettre la pâte dans les moules et couvrir avec un linge. 12. Laisser lever pendant 45 minutes, jusqu'à ce que le pain ait doublé de volume.13. Vingt minutes avant d'enfourner le pain, préchauffer le four à 190° C.
14. Juste avant d'enfourner vos pains, les badigeonner avec le glaçage à l'oeuf. 15. Cuire pendant 40 à 45 minutes, jusqu'à ce qu'ils soient dorés et sonnent creux. 16. Mettre les pain à reffroidir sur une grille. Lors du pétrissage, si votre pâte colle, saupoudrer la d'un peu de farine (1 CS à la fois). Après avoir badigeonné vos pains, vous pouvez aussi les saupoudrer avec des graines (pavot, sésame, tournesol, courge, etc...). Ce pain est délicieux avec presque n'importe quoi. Il est parfait pour faire des Toasts Au Fromage, des Crostinis, des Bruschette ou des Croutons.